While new shipping lanes will be welcome, the real prize is the vast, untapped supply of oil and gas. WASHINGTON – The icy Arctic is emerging as a global economic hot spot — and one that is becoming a security concern for the U.S. as world powers jockey to tap its vast energy resources and stake out unclaimed territories. Diplomats from eight Arctic nations, including Secretary of State John Kerry, will meet next week over how to protect the thawing region as its waterways increasingly open to commercial shipping traffic. U.S. officials estimate the Arctic holds 13 percent of the world’s undiscovered oil reserves, and 30 percent of undiscovered gas deposits. Until recently, however, the lucrative resources that could reap hundreds of billions of dollars in revenues were frozen over and unreachable. But global warming has melted sea ice to levels that have given rise to what experts describe as a kind of gold rush scramble. On Friday, President Obama announced a new U.S. strategy for the Arctic, calling the region “an amazing place” and maintaining a need among nations to protect its fragile environment and keep it free of conflict. “An undisciplined approach to exploring new opportunities in this frontier could result in significant harm to the region, to our national security interests, and to the global good,” the 13-page strategy concluded. The Arctic is getting hotter faster than any part of the globe. Experts predict the region will be free of sea ice during the summer within about 20 years. Sea ice is important because it keeps the rest of the world cooler, and some scientific studies suggest that its melting may be indirectly connected to the extreme weather in the United States and elsewhere in the past few years, changing global weather patterns, including the track of Superstorm Sandy. The environmental changes could threaten not only polar bears, whales, seals and indigenous communities hunting those animals for food, but also islands and low-lying areas much farther away, from Florida to Bangladesh. Yet the melting may be a boon for business. New shipping routes could provide faster and cheaper passageway for worldwide exports and cargo hauling. And it could also bolster global tourism with cruises in the region’s around-the-clock summertime daylight. But the big prize is the vast and untapped supply of oil, gas, minerals and precious metals that are believed to be buried in the Arctic. Already, there is a global race to get energy out of areas that in the past were locked up in ice and frozen ground. In 2007, a Russian research ship placed a Russian flag on the bottom of the Arctic Ocean near the North Pole in a symbolic gesture. And last year, China joined Russia, Denmark and Canada and the United States in the competition, sending its first icebreaker ship through the Arctic — even though China doesn’t abut Arctic territory. Economic rivalries in the Arctic have made the area a burgeoning security priority. Arctic nations are eyeing sending additional military forces to the region to maintain stability on the seas and protect against maritime crime, according to a report last month by the Congressional Research Service. Russia is planning to train and equip a brigade of military troops specifically for Arctic warfare, and Canada is revitalizing its Arctic fleet with $33 billion to build 28 ships over the next 30 years. Norway, Denmark and the U.S. are all expanding military command centers and operations within the Arctic. The U.S. Navy is nearing the end of a five-year plan, set in 2009, to plot out what path it will take in the Arctic. That potentially will include policing waterways and interdicting pirates as it does in warmer waters, officials said. 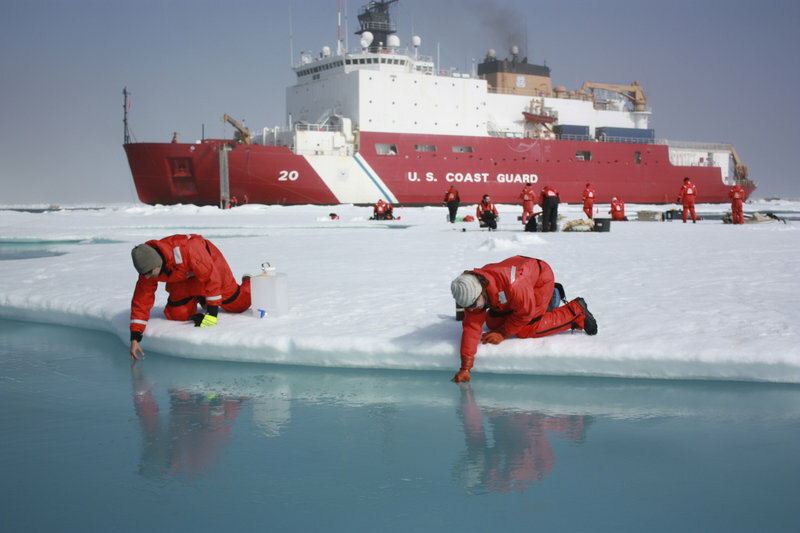 And the Coast Guard’s small Arctic ice-breaking fleet is getting a much-needed boost: One of its three ships is about to be relaunched after being docked for major repairs. Another ship is already fully operational and the third is out of service, officials said. Next year, the U.S. Navy and Coast Guard will draw up plans to have an enduring presence in the Arctic and be able to run search and rescue operations there, Navy chief Adm. Jonathan Greenert said in congressional testimony last month. The military ramp-up is a piece of what experts say is an inevitable political competition that will grow in the Arctic as it opens. The region — and the economic and military forces flocking to it — is potentially the latest front to pit the U.S. and other Western powers against uneasy allies like China and Russia. “This is going to now become a part of the bigger issue: What are the overall political and policy perspectives with respect to China or Russia or the EU?” said Bob Corell, who advises the U.S. and foreign governments about Arctic issues and is a principal at the Global Environment and Technology foundation in suburban Washington. Russia is readying a request to the United Nations for claim territory rights to a sprawling underwater ridge that extends to Canada. Experts say that has unnerved officials in Washington and Ottawa. If accepted, it would give Russia claim to almost half of the Arctic area. The U.S. is not a signatory to the U.N. treaty that charters such decisions, and would therefore not have a vote in the matter. Fourteen governments — including China, India, Singapore and the European Union — now are seeking rights to attend meetings of the eight-nation Arctic Council as observers. Eight nations – Canada, Denmark, Finland, Iceland, Norway, Russia, Sweden and the U.S. – are members of the council. Additionally, six European nations are considered permanent observers and are allowed to attend the meetings. The council meets next week in Kiruna, Sweden, where Kerry will represent the U.S.